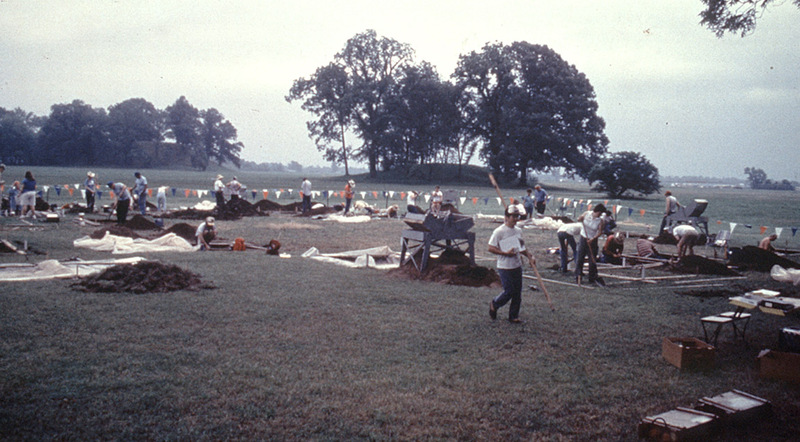 Excavations in progress during the 1990 Arkansas Archeological Society Training Program at Toltec Mounds Archeological State Park near Scott. 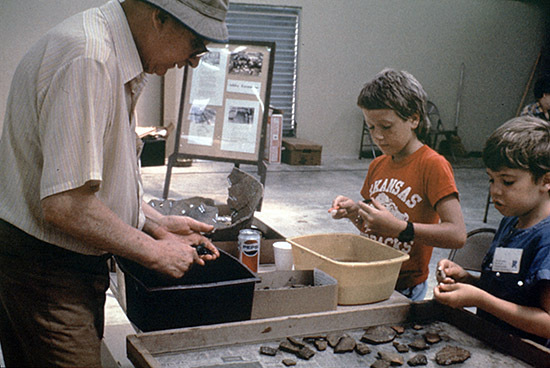 Society members John Jensen, Brandon Holder and Paul Russell in the lab washing artifacts during the 1986 dig. Shortly after the Arkansas Archeological Society was formed in 1960, Bob McGimsey and Hester Davis at the University of Arkansas Museum began to offer Society members the opportunity to help learn about Arkansas cultures and contribute to research through organized field projects. These Society Digs were carried out at archeological sites in need of research that were suitable for a large gathering of volunteers, and were located where camping and classrooms were available. The programs lasted nine days each, with daily field and basic laboratory activities and a schedule of lectures on prehistory and archeological methods. The artifacts and records were turned over to the University of Arkansas Museum for curation and study, and both Society members and the Museum staff reported on each project in the Society’s newsletter and at its annual meetings. From the beginning, the Society and Museum stressed responsible research practices and collection management while giving volunteers the chance to contribute to important research needs. When the first group of Survey Archeologists joined the newly formed Archeological Survey in 1967, the Society Digs became a joint Survey-Society program and the Survey Archeologists took over field and teaching responsibilities with the help of experienced Society volunteers. Field projects took place across the state and varied in scale from brief four-day tests to longer nine-day explorations. Lecture programs continued in response to popular demand, and most excavations also scheduled an open house day to show local residents what archeological projects were like. All participants were Society members, and the records and artifacts resulting from each project became the property of the State of Arkansas through the Archeological Survey. 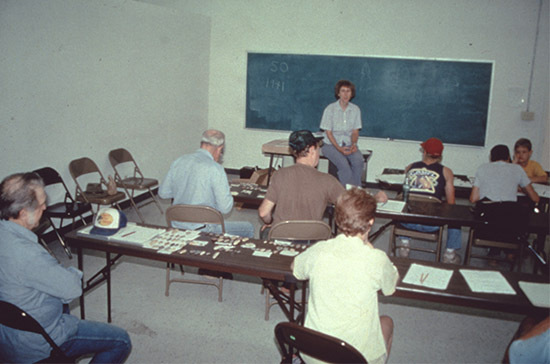 Station archeologist Martha Rolingson teaching a lithics seminar. The 12 seminars offered in the training curriculum are a mixture of classroom lectures and hands-on experience. After a few years’ experience with the program, archeologists and volunteers proposed a reorganization to address wishes for more research results and more educational opportunities. The first project under an expanded program took place in 1972 at the Ferguson Site, a prehistoric Caddo mound center in southwest Arkansas that had been discovered in imminent danger of demolition a few months earlier. The revised Society Training Program featured a 16-day summer field research project with laboratory work and evening lectures on a variety of topics. From a research perspective, the longer field session meant that archeologists could pose more substantial research questions and gather more information. For volunteers, the longer field session offered an enhanced learning experience and an introduction to more field and laboratory methods and techniques. Since most of the Survey’s professional archeologists participated in the program each year, volunteers also had an opportunity to learn from and interact with several archeologists who each had their own areas of expertise. 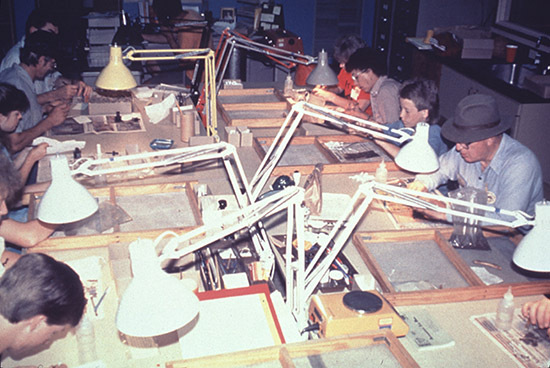 Artifact lab at the 1989 training program at Toltec Mounds. In 1972 a second program was embedded within the expanded training program that offered volunteers the opportunity to work through a formal curriculum and earn recognition at several levels of achievement. The Certification Program curriculum was made up of 12 courses, along with a variety of skills, field activities, and writing assignments. Participants received log books to record their activities and keep track of skills and hours worked in the lab or field needed for the various achievement categories. In the 35 years since its inception, several thousand people have participated in the Certification Program, and some participants have been with the program almost from the start. Needless to say, the program has undergone modifications and continues to develop. New courses outside the “standard” curriculum are offered each year. The program is voluntary and has no set time frame. Most participants do not intend to work through all of the possible achievement levels, and many people enjoy the Training Program without using the Certification Program at all. General enrichment activities have become an increasingly important part of each year’s schedule. The Archeological Survey/Archeological Society Training and Certification programs have had widespread influence on professional and amateur programs across the country. While none have duplicated the Arkansas model, numerous states now have volunteer field projects, enhanced lecture programs, and other activities that foster archeological research and provide public enrichment experiences. 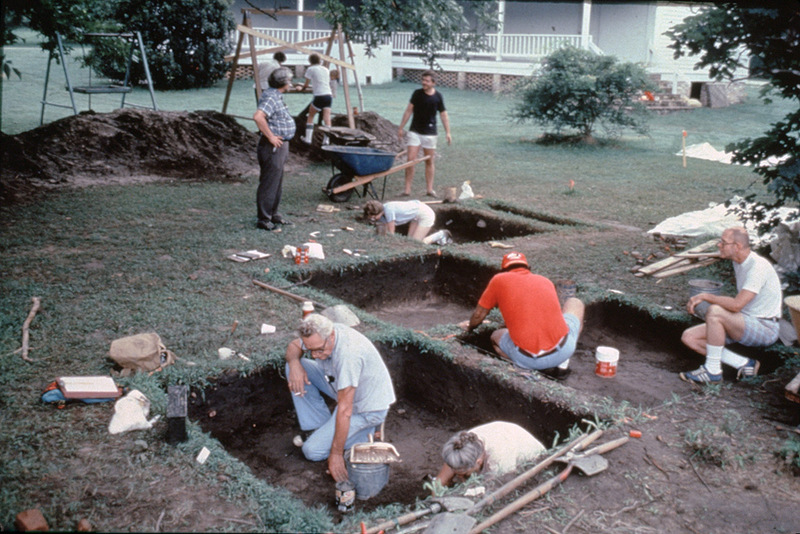 1981 excavations at the Sanders House site, Historic Washington State Park.